Description ADULT Has olive-gray upperparts (Alder's upperparts are usually subtly greener). Has faint pale eyering (on average, less distinct than Alder) and pinkish orange lower mandible. Wings are dark with pale fringes to inner flight feathers and two white wing bars; tail is dark (wings and tail slightly longer in Alder). Underparts are pale with pale olive wash on chest. JUVENILE Similar to adult, but with buffy wing bars. 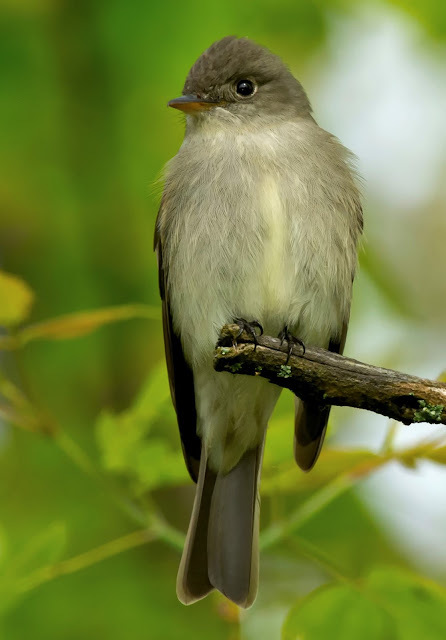 Endangered Status The Southwestern Willow Flycatcher, a subspecies of the Willow Flycatcher, is on the U.S. Endangered Species List. It is classified as endangered in Arizona, California, Colorado, New Mexico, Texas, and Utah. Destruction of the dense streamside thickets that it nests in has dealt a serious blow to this species. Another problem has been nest parasitism by cowbirds, which lay their own eggs in the flycatchers' nests, to the detriment of the flycatchers' own broods. Predators, especially those that feed on eggs, have also contributed to this small bird's decline. Habitat Fairly common summer visitor (mainly May-Aug) to damp woodlands and often associated with its namesake tree. Winters in Central and South America. Observation Tips Best identified with certainty using voice; fortunately, like Alder, sometimes sings on migration as well as on breeding grounds. Voice Song is a harsh, buzzing fzz'Byew; call is a sharp whuit. Discussion Widespread woodland flycatcher. Best separated from Alder using voice. Occurs as several subspecies: eastern birds (described in detail below) are almost identical to Alder; western ones (outside range covered by this book) are subtly browner and darker. Feeding habits similar to those of Alder: engages in aerial sorties after flying insects from perches near top of trees; also hovers and gleans insects from foliage. Sexes are similar. Migration Info This unassuming flycatcher slips into the United States in late spring and passes back into Mexico well before winter, after a short (70- to 90-day) breeding season. The bulk of the western population moves north along the Pacific coast of Mexico, then fans out across the western United States. Eastern populations move north and east after crossing western Texas. Although this bird spends most of its life in migration or on its wintering grounds in South America, the major threat to this species is loss of breeding habitat in the United States. The Southwestern subspecies (now on the U.S. Endangered Species List) is threatened by loss of habitat due to water diversion practices, livestock overgrazing, and non-native plants that degrade critical breeding habitat.